In the early 1960s, Florence Ponting (Saoirse Ronan) and Edward Mayhew (Billy Howle), meet and fall in love, despite the differences in their backgrounds. Florence is a talented violinist from a well-to-do family, while Edward, although a university graduate with a degree in history, is from a family of more modest means. His mother (Anne-Marie Duff) has a brain injury from an accident and behaves erratically. However, after Edward meets Florence, the young woman's presence has a calming effect on Edward's family and his father suggests to Edward that he should marry her. 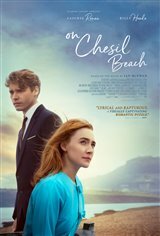 The two young lovers do marry, and honeymoon at a seaside hotel on Chesil Beach in Dorset. However, on their wedding night, things go terribly wrong. Based on the novella On Chesil Beach by Ian McEwan, whose novel Atonement was previously made into an Oscar-winning movie starring Saoirse Ronan.